I love being able to bring your logo to life! Contact me to work on your custom logo needs. Below are some of the company logos we have done for our clients. Jayme at Salt & Shea Skin Apothecary came to me to help create the logo banner she had thought up. This was the largest scale painting project we had done & one of the first on fabric. The outcome was beautiful & when Jayme shared her setup photo on Instagram we were contacted by others who needed a market banner too. The Logo Market Banner line was born. Hand Painted using heavy duty canvas material. All paint is sealed with a UV protectant. We have tabs sewn into the and bottom. This allows for rope or PVC pipe to be fed through. SHOP MARKET LOGO BANNER HERE. This logo project was done for Mile Preschool in West Sacramento, Ca. Painted on wood. The brown shown here is stained wood. Everything else was done with paint and sealed for protection. Baba Love Organics was so great to work with! They reached out after seeing an image on Instagram by our client Salt & Shea. These market banners are just the right size to hang at the back of the average 10′ x 10′ pop up tents. They can even hang in a larger space using a little longer rope. (rope not included but can be purchased at your local Lowe’s/Home Depot. 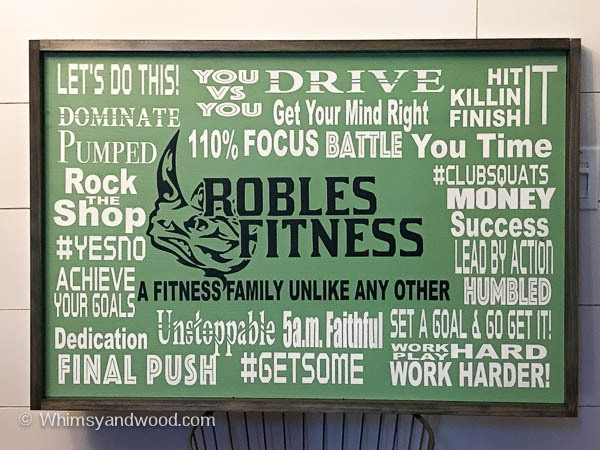 If you are in the Sacramento area you may want to check out Robles Fitness. A group of their students commissioned this logo project along with some of their instructor’s favorite phrases.